Outsource2india provides top quality car photo clipping services to some of the world's top car manufacturers and dealers as well as magazine publishers. 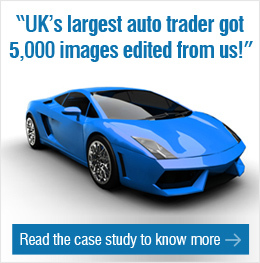 Car image clipping requires certain skills and expertise to make the images look realistic and appealing to the eye. Our team of experienced photo editors is trained to work on the latest image clipping tools and technologies, and have worked hand-in-hand with automobile dealers and magazine publishers to perfect the art of car image clipping. Our team of photo editors has the skills and expertise to accurately clip car images and remove any unwanted objects along with distracting backgrounds. In addition we also add shadow effects which give the images a professional and polished look. Sometimes a car dealer may not have the required color of a particular model of car. Our team of photo editors can help in changing the color of the existing car to the one desired by the client before deciding to buy the car, while ensuring the new color exactly matches the production model. We provide the best image stitching services for car images and help in adding a 3D feel to the images. The customers can see the car images in a unique 360 degree view. We can stitch together several images for an in-depth customer experience, while adding roll over and click-to-zoom functions for a comprehensive 360 degree car view. We provide top quality car photo retouching services at very cost-effective rates. The various retouching services we provide include clearing of scratches, creating missing car parts, adding text, removing stickers, etc. Why Choose O2I for Car Image Clipping Services? Outsource2india has been providing the top quality car photo clipping services and a host of other photo editing services to clients around the globe for over 20 years now. Our experience of having worked with different clients and businesses helps us easily understand various business models and provide the services accordingly. Our cost-effective and specialized car image clipping services helps companies save time and generate better revenues. If you too want to utilize leverage from our car photo clipping benefits, then get in touch with us or talk to one of our representatives and we will help you out with the entire process.